“Hands-down, the finest writer of Yankee life today is this guy, Howard Mansfield. Howard Mansfield sees things differently than most of us, and he points stuff out that most of us miss. Robert Frost had this ability to look at something familiar, say a leaf or a tuft of flowers and find a depth of meaning that, until we read the poem, eludes us. Howard Mansfield has written 13 books and lots of articles. But my recommendation, if you are not familiar with his output or style, is this: it is a modest book entitled Summer Over Autumn. This book is funny, this book is profound. I found myself saying, ‘darned if that isn’t true,’ a number of times. Characters here that anybody who has lived in a New England town for any time is familiar with; people who care, people who are selfish, people doing brilliant things, people doing dumb things. Top 12 Nonfiction Book for 2017 – Water Street Bookstore, Exeter, New Hampshire. Howard Mansfield “is one of those writers who is not only gracious to bookstore staff and part time book reviewers (and probably everyone else) and whose writing is warm and funny but also, as they say in these parts, wicked smart. He’s a kind of a people’s intellectual, whose cultural and historical knowledge sparkles on the page but whose ability to read other human beings, and not surprisingly since he is married to Sy, animals, infuses his essays with a generosity that makes you feel like you’re sharing in his brilliance, not having it bestowed upon you, the lowly reader. “… I just really admire the way Howard takes ordinary things like yard sales or his local garage and creates something beautiful on the page not only because he notices things and writes well but because he cares about people’s stories. In “On Going Late to Yard Sales,” for example, he writes about the “puzzles that are left when the boxes are nearly empty,” and the way the sellers seem to have “watched themselves scatter to the winds.” Something I had never really thought about, but I recognized when I read his essay. At a time of change, when common ground is becoming less common, it helps to have a tour guide who can navigate the American landscape. That’s a job for Howard Mansfield, who offers a unique lens on our history, customs and habits. A cultural historian and author of eight books, Mansfield is the guy you wish could accompany you on a long walk. You just know he would see things that you’d miss along the way. 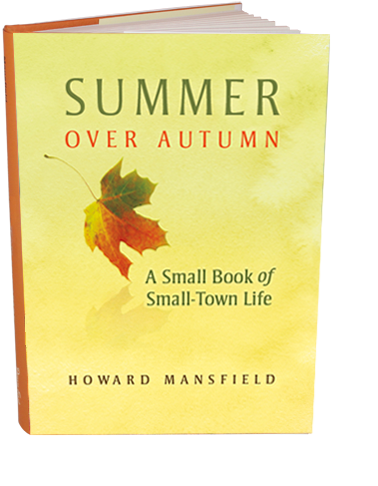 “Summer Over Autumn: A Small Book of Small-Town Life” is Mansfield’s latest title, a collection of short essays that’s modest only in size. These 21 eclectic pieces find the author out and about in his hometown of Hancock, New Hampshire; running in a local election; working his land; and tending to Christopher Hogwood, his very theatrical pig. The book highlights Mansfield’s range, showing him to be equal parts citizen, philosopher and cultural critic, weighing in on issues large and small. Among his musings, he tackles the thorny problem of elders behind the wheel; considers the jagged history of a Queen Anne chair that he inherited upon buying his house; and laments the planting of invasive roses that won’t give up. If Mansfield has a knack for elevating the ordinary and seeing it fresh, he is equally adept at decoding transactions that are often mired in complication. Two of the best pieces in the book exemplify this skill: In “The Ask,” Mansfield takes on the matter of fundraising and how the ritual dance of asking for donations clashes with our sensibilities. And his essay, “On Going Late to Yard Sales,” is sufficiently astute that you’ll think twice about showing up early. “Summer Over Autumn” is one of those books that you read, nodding in assent. Mansfield delivers an embarrassment of quotable lines and passages – more than many writers manage in a lifetime. While much of the book centers on small-town life, the takeaway from each piece tends to be universal. Mansfield’s wry, humane, poetic brand of common sense has no geographic bounds. “Regional writing is my favorite kind. It is not big or ambitious. It’s about something other than self. It often is a love letter. I am crazy about Howard Mansfield’s books. His depictions of New England towns and buildings and weather and friends embody the idealized America for a lot of us around my age (79), even if we have never been there. They are about meeting houses and churches, barns, inherited clocks – and the kindness of discretion. How badly we need these reminders of what it takes to belong with others in community, in communion. This slender book of essays focuses on one place, Hancock, New Hampshire, and its inhabitants. But Hancock is a jumping off place for this thoughtful writer. From the get-go, he captures the shared qualities of American small-town life in observations, such as, “…villages are the story of the rise and fall of one commodity: clothespins, shoes, rocking chairs, buggy whips.” He notes: ‘The biggest house is next door to one of the smallest.’ He tells us that the American version of the ubiquitous Queen Anne dining chair is like a gown made of denim instead of silk. The reader, wherever she is from, is compelled to do a lot of bracketing and underlining. “There is a kind of plot to Summer Over Autumn. The central question might be, ‘What will America be if this iconic lifestyle is no longer sustainable?’ It’s like global warming. You know something is being lost incrementally, but you don’t usually see it slipping away. (The recent dramatic videos of the calving off of glaciers present an exception.) The essay titled “Summer Over Autumn” suggests that changes are anticipated. But those moments when one season becomes another are hard to identify, much less to predict. The author’s particular experience, seated in a kayak on a pond, evokes in my mind Emily Dickinson (‘There’s a certain slant of light…’); he knows ‘the party’s over’ and that the change from one season into the next is like ‘passing through a doorway.’ Mansfield wonders: ‘If we could inhabit a still-point, floating as if we were in a kayak, would we be aware of the many doorways we daily pass through?’ Yet he acknowledges cycles. A young loon attempts to lift off the pond, flapping the length, gradually rising, having to circle to get above the trees. A new creature pretending to be a bird. As always…. “This is the kind of book you don’t have to read from first page to last—you can dip into it at any place between the covers, at any time—I turned to a brief chapter titled “Fourth of July.” In just three pages about the different effects that the fireworks celebration in the author’s small town of Hancock, New Hampshire, had on several of his neighbors, his words evoked an emotional reaction that made me put the book down for a couple of minutes to think about what I had just read…and then turn the pages to begin reading another chapter. “I was hooked! At that one sitting, which I had intended to be for only a brief glance at the Table of Contents, I devoted three hours to reading more than half of “Summer Over Autumn.” I would have completed even more except for the fact that, after each essay, I closed the book, sat back and thought about the story I had just read—the feeling it had stirred in me, and the message it had passed along. The very next day, I returned to read the rest, savoring author Mansfield’s warm, perceptive and heartfelt descriptions about the people, places and daily events of his small town life…. “A delicious little collection that I received as an ARC from the publisher. I knew little of the author or the publisher prior to getting this in the mail. When I opened the book and began reading, I was actually surprised that all of the essays that I encountered in the book were in locations that I was intimately familiar with. From Marlborough, to New Ipswich, to Peterborough and Keene, New Hampshire, this book contains a handful of essays that concern country living and aging in the hard-weathered atmosphere of New England. Each piece effectively and beautifully straddles the lines between the old and the new. The local and the national. Each essay is uniquely American, showcasing a life that no matter how far into the future we travel, is one we all will live. A gorgeous collection that will certainly find great success as it has already traversed the pages of Yankee, The Boston Globe, and New Hampshire Home, but will become quiet, meditative a staple on New England bookshelves. “Excellent book. I want to re-read it and savor each essay. For those who want a glimpse of small-town life, this will more than satisfy. If you live in a small town, you may smile in recognition. I’ve dreamed of living in New England in a small town. This book was like almost crossing this off the bucket list… or maybe moving it up further on the bucket list. "The first frost is a hog's holiday. It's as if the whole world tilts and vegetables roll toward the commodious jaws of our pig, Christopher Hogwood; zucchinis the size of baseball bats, tomatoes that were caught on the vine, broccoli that has bolted, squash going soft in one spot. Our friends, gardeners, come and render unto Hogwood that which is his. The dreams of the winter seed catalog, the toil of the blackfly season, the loyal watering of July, he takes it all in, joyfully grinds it down—grabs a pumpkin and shakes it from side to side, crushes a beet, snout upward, with red beet juice dripping from his jowls."